Recently, I was perusing a file full of scenery pictures taken during birding trips over the past 14 months and it occurred to me that we visit some amazingly beautiful corners of the globe while birding. With that in mind, I selected a bunch of photos, all taken in western North America since August 2008, that remind me of good birds, good company, and how much I enjoyed the scenery captured in this collection of images. 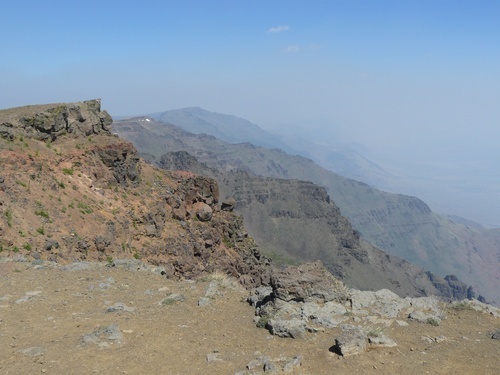 Those who've visited the summit of Steens Mountain in southeastern Oregon will tell you that it is one of their favorite places. The stunning view of the Alvord Basin looking east from the East Rim Overlook was compromised by forest fire smoke during this visit. On the day that this picture was taken (10 August 2008), Diane Pettey and I saw a small flock of Black Rosy-Finches feeding on the rocky slope just below the viewpoint. Steens Mtn. is the only place in Oregon where one can expect to encounter this species. 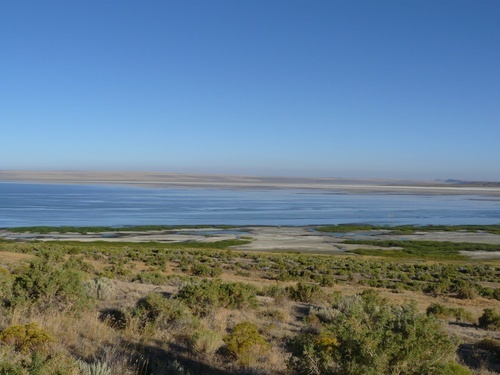 Off the beaten path and far from any major population center, Lake Abert in Lake County Oregon hosts an amazing, and mostly unknown birding spectacle during late summer. Phalaropes (chiefly Wilson's with lesser numbers of Red-necked) by the hundreds of thousands and gulls (California, Ring-billed, and Franklin's) by the tens of thousands convene at this playa lake to gorge themselves on the brine fly hatch. In some years, as many as one million birds may gather here during early August. We estimated at least 400,000 Wilson's Phalaropes were on the lake when this photo was taken (9 August 2008). Abert Rim, which rises steeply along the east side of the lake, is stunning in its own right. 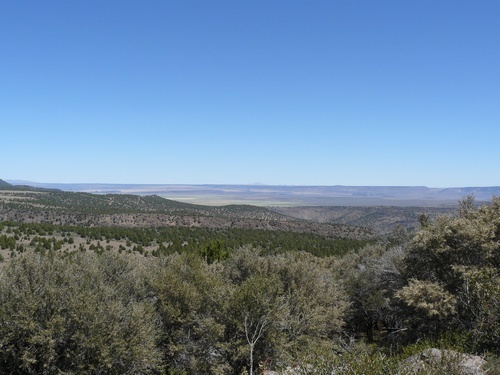 Later the same day, Diane Pettey and I spent several hours birding the patch of mountain mahogany in the foreground of this image. This site, along Big Valley Rd. s. of Adel, Lake County, Oregon hosts good numbers of Juniper Titmice and our efforts produced a long-overdue state bird for me on 9 August 2008. 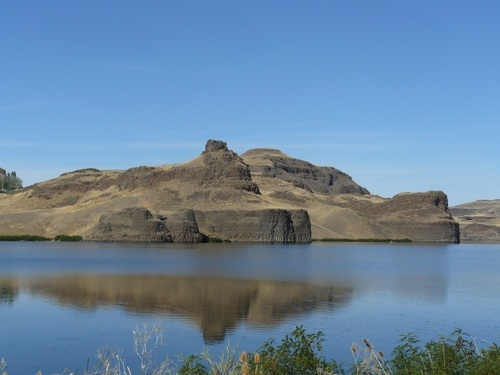 The "channeled scablands" and coulees in eastern Washington are part of a unique landscape that resulted from repeated scouring from the Missoula Floods during the last glacial maximum. This image, taken from Lyons Ferry State Park along the Snake River in Franklin County offers but a small sample of the stunning beauty of this region. During a five-day trip to e. Washington in September 2008, Steve Mlodinow and I seemed to run into vagrant birds everywhere we went. Lyons Ferry produced a Blue-headed Vireo, a Blackpoll Warbler, a Northern Waterthrush, and a Nashville Warbler showing characteristics of the eastern subspecies. The day before this photo was taken, Steve and I (and several others) relocated North America's 4th Variegated Flycatcher at nearby Windust Park. The flycatcher had been discovered the evening before that by Mike and MerryLynn Denny. The face of "Chief Washtucna" watches over the small community of Washtucna in Adams County, Washington. A well-watered municipal park in the middle of this modest settlement is a magnet for migrant passerines and often attracts eastern vagrants during spring and fall migration. On the day this photo was taken, Ryan Merrill found a Chestnut-sided Warbler just w. of the park. Two days earlier, Steve Mlodinow and I found Washington's 2nd Bell's Vireo in the park. Rising to an elevation of 4097 feet, Mary's Peak is the highest point in Oregon's Coast Range. From the grassy opening seen above, one can see both the Pacific Ocean to the west and the Cascade Range to the east. This oasis of grass collects a variety of migrant grassland birds such as longspurs, pipits, horned larks, and sparrows. In most years, small groups of Gray-crowned Rosy-Finches can be found about the summit from October through early Spring. About a dozen rosy-finches were seen during this visit on 26 October 2008. The summit meadow is ringed by noble firs, a species of very limited distribution in the Coast Range, where most peaks fall short of the elevations where this tree thrives. The glow of the morning sun across this otherwise austere and snow-covered hill along Washington Hwy 14 in the Columbia Gorge created an illusion of warmth...until we stepped out the car. In mid-December 2008 Steve Mlodinow and I took a long weekend trip up the Columbia River, birding our way east to the Walla Walla River mouth at Wallula, Washington. Over the first two days we enjoyed rather comparatively mild temperatures (low 40s). On 14 December we awoke to two-plus inches of snow and barely double-digit readings on the bank sign across the street from our motel in Umatilla, Oregon. As we made our way downriver, we found a Mallard X American Wigeon hybrid near Maryhill, Washington, the first of this cross ever detected in Washington or Oregon. After enduring one of the worst winter storms to ever grip the Pacific Northwest, Steve Mlodinow and I were more than ready to board a plane and head off to the southern tip of Baja California Sur, Mexico in early January 2009. For the entirety of our 9-day visit the skies were essentially cloudless, as seen in this image of the Estero San Jose. The Sierra de la Laguna mountains loom in the background. High temperatures hovered around 80-85 and the birding was fabulous. We encountered several species that are semi-rare to rare in the area. Highlights included a Ruff, a Red-throated Pipit and a Blackpoll Warbler. 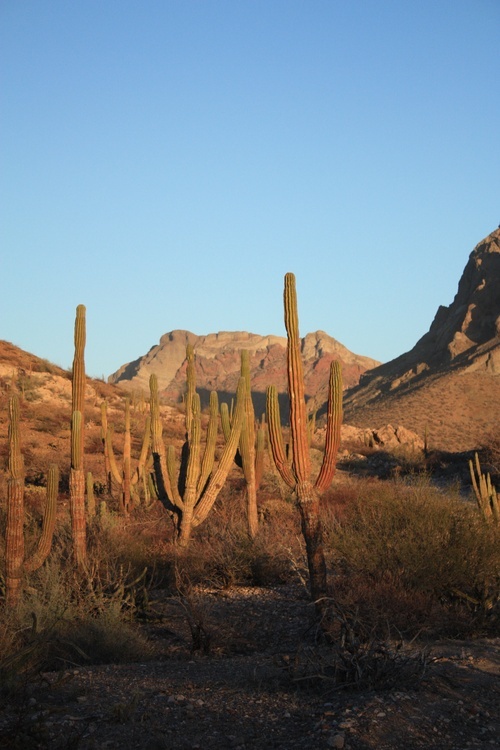 As evidenced in this desert scene n. of La Paz, much of the landscape of Baja California Sur is vegetated only by short thorny shrubs and el cardon cacti. Thus areas with water and riparian corridors teem with birds. Mixed flocks of flycatchers, vireos, warblers, orioles, sparrows and buntings sometimes number into the hundreds. Although the majority of passerines found in these flocks are species that nest in the United States, several endemic species and subspecies are welcome diversions from the more familiar birdlife. 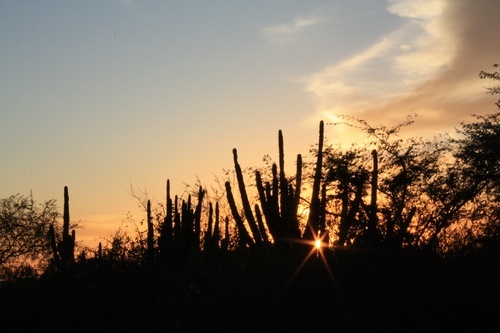 The silhouettes of el cardon cacti enhance this sunset shot taken at El Rosario, Baja California Sur, Mexico on 14 January 2009, the last night of our trip. A small nearby reservoir hosted Least Grebes, the only ones we saw on this trip. Like the Statue of Liberty in New York Harbor, California's Golden Gate Bridge stirs the emotions of nearly all who pass over or under it. 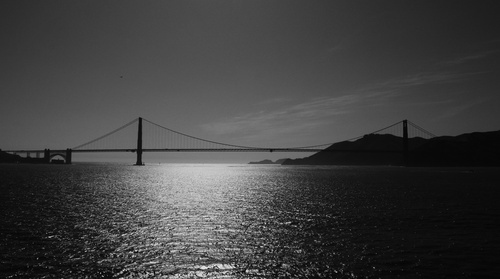 I took this picture as we sailed west out of San Francisco Bay aboard the Star Princess on 7 May 2009. For birders, the open ocean remains one of the last frontiers, where anything seems possible. The day after this picture was taken, most of the 20+ birders aboard this cruise ship saw their life Murphy's Petrels. Ultimately, we saw them off of every county from Del Norte County, California to Pacific County, Washington. In all, we saw more than 40 Murphy's during this trip. This image, taken near the Pete French Round Barn in Harney County, Oregon 24 May, will forever remind me of a Memorial Day Weekend trip with my two teenage daughters and one of their friends. We saw no rare birds, but that mattered not to the girls, who got excited about seeing Yellow-headed Blackbirds, Black-necked Stilts, and fuzzy juvenile Great Horned Owls. On 24 May 2009, Diane Pettey, my daughter Lilly and I climbed to the top of South Coyote Butte to watch the sunset. Little did I know, that a few months later I would drive most of the night to spend half a day searching around the Malheur Field Station (seen in this image) for Oregon's 1st Lesser Nighthawk, which was photographed here on 27 August 2009. I didn't re-find the nighthawk, but I spent a few hours drifting in and out of sleep in the bed of a pickup while listening to the constant chatter of young Barn Owls overhead. After giving up on the nighthawk, I spent more than an hour photographing juvenile Soras and Virginia Rails as they fed in plain view at a nearby wet area. 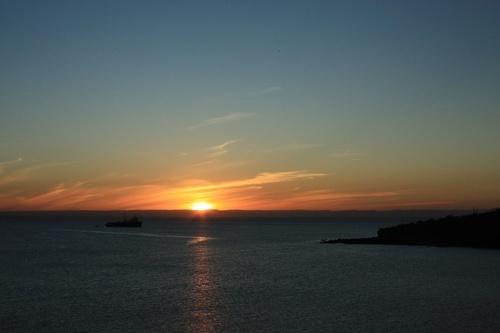 I can recall my thoughts as I snapped pictures of this sunset glistening off the Bahia La Paz, n. of La Paz, Baja California Sur on 13 Jan. It was our next to last night of eight spent in Mexico and I was reflecting on how this magical trip was about to come to an end. I was not ready to return to the foggy, cold Pacific Northwest. But then again, when are we ever ready for such trips to end. Long after the mental images of individual birds have become murky or faded away entirely, my recollections of landscapes and those that I shared them with remain crystal clear. Each of these images bring to mind the broad set of experiences, emotions and friendships that made these birding trips so memorable. I to agree that I have seen some of the most beautiful scenery just from tagging along on bird trips with my dad. Although me and my siblings are not avid birders like my dad, we still enjoy the time spent and the opportunity and adventure to go along to all of these places with him. Birdwatching as been a larger part of my life and im not even the birder! but Its always a blast. During a birdwatching trip with my dad, theres always inside jokes, good music, and lots of good food too! I’ve enjoyed these trips all of my life and I thank my dad for that. These pictures are beautiful! Lilly’s right, while we may not always share our dad’s interest in birds, we are almost always up for the journey that accompanies his hobby. I have seen one of the only state records for a Lucy’s Warbler, but that doesn’t make me nearly as happy or excited and getting to spend the afternoon watching ground squirrels at Malhuer Headquarters. Every father should be so lucky. The comments above warmed my heart and made my day yesterday, but the girls neglected to mention one important factor that fostered their love of adventure and the desert. Their mother (Kori) was the one who took them on their first trip to Malheur. That trip occurred at a time when Kori and I were separated, before our ultimate divorce a few years later. The kids still talk about that original trip, which happened when they were 4-6 years of age. Kori’s maternal grandfather, Robert “Tuff” Manning, hunted on Steens Mtn. for many years, thus she had heard stories about the Oregon high desert country as a child. I can still remember her first trip there (with me before we married) and how she instantly came to love the landscape. I see that same joy in our daughter’s faces on those occasions when we travel east. Ironically, I attended Tuff Manning’s funeral two days before taking the first picture in this essay. My thoughts turned to Tuff often as we made our way to the summit. I can remember having discussions with him about how much he enjoyed his time in the Steens. I’m sure he too would smile if he were alive to read the comments of his great-granddaughters. As for me, I’m just a temporary caretaker of these traditions. They didn’t start, nor will they end with me. You are indeed a lucky guy. Not only do you have two wonderfully eloquent daughters but you live in a very very beautiful place.